Great work! Reminds me of a real gameboy game. Nice puzzle mechanics and a great soundtrack! Best soundtrack of any game I've played so far, and a very polished experience. I agree the movement speed was too slow though. Really great premise, could easily see this being expanded into a full-on zelda-esque game with lots of dungeons and spells. I would definitely keep working on it. Best platformer I've played so far. You nailed the balance of control and slipperyness that great platformers have. Exceptional work. Really awesome work; very fleshed out and fully-realized with tons of variety. Platforming controls felt a little slippery for me, but otherwise great stuff. A map would've been a lovely too. Really clever concept. I agree with the other comments about the reloading being confusing; maybe having a larger ammo capacity and only being able to reload when on solid ground would help? I love time management games, so I was excited to see one pop up in GB Jam! Very good premise and execution. Only complaint is there were probably too many designs; made flipping through them all tedious. Definitely evokes that classic shmup feel. Would've loved some extra lives though! I dug the visual style and the comedy premise. Great choice of palette. My biggest issue was with the controls; changing directions felt very slippery. Also think I found a minor bug; the onscreen hearts didn't disappear as I took damage. Hey, this is awesome! Really creative idea. Its a little too easy because there's no penalty for misfiring, but the premise is super solid and well executed. Exploration felt really good; thought you placed the upgrades, hearts, and checkpoints nicely. My only real gripe is that you took your player art/anims from Links Awakening; would love to see your own stuff! Congrats on your first jam! I dig the visual style. Difficulty could use some tweaking; it was too easy until a shark showed up, and then he killed me right away. Best looking game I've seen. Definition of 5 stars. Couldn't figure out how to progress in game though. Definitely nails the gameboy feel, with compelling platforming and combat. Graphics are great; I especially liked the explosion and blood effects--you used the limited palette in very creative ways. Exploration felt a bit tedious, as I never felt like I was unlocking great upgrades, and the splash damage on the explosives was a bit unforgiving, but overall I was really impressed. Interesting, unique premise; love the cameras in the top corner. A bit too easy in execution, but a really cool idea to build on! Incredible art, A+ animations, nails the metroidvania look and feel. Incredible. Its a simple premise, but your puzzles are really excellently designed. The introduction of new mechanics and the ways they are combined is really professional. Great job! Good core mechanics. I felt the enemies came way too fast though; a smoother difficulty curve and clearer differentiation of enemy health would help I think. Great art and really feels like a gameboy game. I got killed pretty much instantly upon spawning in one of the later rooms though. Love the artwork; enemy variety and animations are great. Gameplay is very solid but maybe a bit too unforgiving; being able to take multiple hits would be nice. GBJAM 5 community · Replied to sitebender in Micro-review thread: Review the entry of the poster above you! Thanks for the feedback! Definitely had some issues making the fighting feel as responsive as I would've liked and ran out of time. 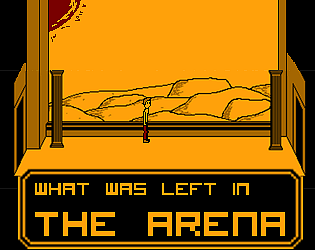 My GB Jam submission, What Was Left In The Arena, is live and I would love for you to check it out! The game features Punch-Out esque combat against a variety of enemies, each with their own combat style. Between bouts in The Arena, you'll get to explore the world, meeting and befriending (or loathing) the men you will be forced to battle. I tried to focus a lot on the atmosphere and story, which has a few twists at the end, so there is satisfaction to be gained from completing it! This has been my first GB Jam, as well as my first time doing pixel art and programming in Game Maker, so I would love your honest feedback! I'm going to try to play and rate as many games as I can, but I'll definitely be sure to return the favor by playing your game if you check mine out. GBJAM 5 community · Replied to Mientje in Micro-review thread: Review the entry of the poster above you! Thank you! Looks like we tried to accomplish similar things with our stories. My first stab at pixel art too. Nightingale: Dying Commander is a Fire Emblem-esque tactics game in which you control a small band of warriors fighting their way through enemy territory. 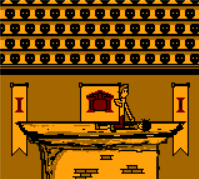 The game features perma-death, so if one of your teammates dies in battle, they are lost forever. The visuals in this game are stellar. The title screens feature detailed pixel art, while the combat sections are clear and straightforward. UI and sound effects are all nice, too. The perma-death is a really excellent addition. The characters in your squad all have names, and you really feel an emotional gut-punch when one of them dies. The game is quite hard as a result, but the difficulty curve is pretty smooth. One gripe I have is the game doesn't explain its combat systems very well. You can attack enemies adjacent to you, but I didn't realize you could dash over an extra space to hit an opponent. Knowing exactly what you can and can't do in the game, rather than having to figure it out, would have spared me some trial and error that cost me precious team members. Enemy AI is a bit inconsistent, but is overall very strong. Overall, I think this is an exceptional entry, giving a great GB Jam spin on tactics games and managing to deliver an emotional experience in a very short time.